The Chinese-built J-20 stealth fighter jet has been the subject of speculation since its first known flight in 2011, and indeed for years prior during its development. Today it finally made its public debut. That didn’t come with many technical details, but the aircraft is most definitely operational. CNN reports a pair of the new J-20 jets made a few stunts and passes over the 11th China International Aviation and Aerospace Exhibition in Zhuhai, about 35 miles west of Hong Kong, at the hands of the country’s Bayi Aerobatic Team today. The J-20 is being called China’s fifth-generation fighter jet, and has allegedly been in development at the Chengdu Aerospace Corporation since at least the early 2000's. Its primary mission appears to be short and long-range air-to-air engagement. “The J-20 aircraft is China’s own new generation stealth fighter, developed to meet the needs of the future battleground,” Chinese air force spokesman Sr. Col. Shen Jinke said last week in a statement according to CNN and others. Not a whole lot of detail there, but it’s been speculated by NationalInterest.org and others that the J-20 has a “phased array radar,” substantial electronic-warfare equipment and an “electro-optical/infrared sensor” that’s conceptually similar to what the American F-35 uses. It’s also been said that the J-20 will carry weapons for fighting other planes up close and at a distance, with its missiles concealed in retractable housings for maximum radar deflection according to AIN Online. As far as how the J-20 stacks up to American combat aircraft practically speaking, comparisons are being drawn to the F-22 air-to-air/air-to-ground jet and of course the F-35 which is supposed to be able to do everything. Air Force Chief of Staff Gen. David Goldfein says networking is the key to the F-35’s advantages. Goldfein went on to say China’s J-20 is more like the F-117 Nighthawk according to BreakingDefense and others. Despite the F-117 still looking like a spacecraft from 100 years in the future, it was actually active in the 1980’s and is now effectively retired. It’s safe to assume that the Air Force Chief of Staff has more intelligence on China’s new jet than I do, and that the U.S. military isn’t dismissing the J-20 as casually as they appear to be with Goldfein’s quote. 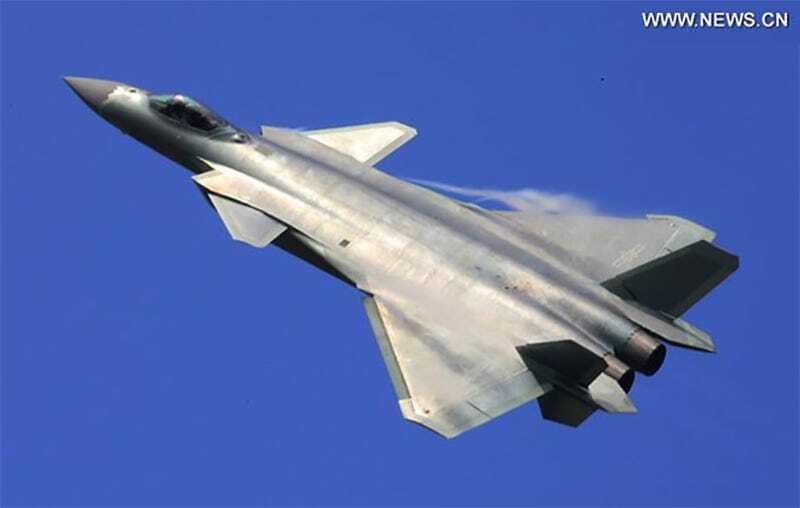 Back in 2011 our old friend Tyler Rogoway posited that while the American F-22 might be more maneuverable than the J-20, the Chinese plane would have the advantage of stealth over a longer range since it wouldn’t be as reliant on support aircraft. We will keep you posted as more details on the J-20 come to light, possibly over the course of Zhuhai air show that’s currently underway.